Back in the late 1970s, when I first started collecting holiday jazz albums, the entire sub-genre probably included no more than two dozen albums (a few of which still haven’t been released on CD, dagnabbit!). These days, at least that many pass through my fingers each year. As with the 2003 round-up, this year’s cornucopia of wealth results in great part from several afternoons spent listening at cdbaby, where I found roughly half of the albums cited below. Being able to pre-listen to multiple cuts allowed me to avoid some obvious clunkers (and the better part of valor demands that the guilty parties simply go unrecognized). Still and all, it’s once again a very good year for holiday jazz, as the exhaustive discussion below reveals. Given the increased consolidation of radio station and music store ownership, it’s now irrefutably true that you’ll never hear or see some of the best music at conventional outlets. The world is full of talented musicians, far too many of whom struggle to be noticed beneath the ClearChannel/Wal-Mart radar. Do yourself a favor: Get a few of the cdbaby listings cited here. Santa’s swingin’ elves are certain you’ll be pleasantly surprised. Let’s start with a welcome blast from the past. Longtime music fans always maintain a List of Those That Got Away, generally vinyl LPs that are decades out of print. 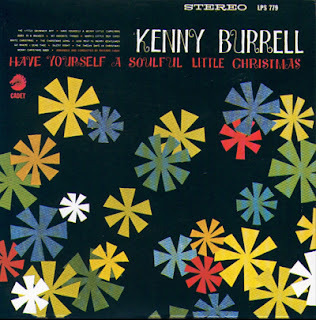 Despite the now quite impressive size of my Christmas jazz library, I have just such a list, and one album thereon — jazz guitarist Kenny Burrell’s 1966 release, Have Yourself a Soulful Little Christmas (Cadet 779) — finally has been re-issued on CD. The album sounds a bit quaint, due mostly to the overly large orchestra backing Burrell, who really doesn’t need so much gloss or glitz. When he cooks, though, he really cooks, as with his reading of “My Favorite Things.” I still don’t regard this cut from The Sound of Music as a true holiday song, but Burrell comes close to making me a believer. He contributes a wonderfully bluesy rendition of “Merry Christmas, Baby,” and puts considerable swing into his cover of “God Rest Ye Merry, Gentlemen.” One of the album’s best finger-snappers isn’t a Christmas tune; “Go Where I Send Thee” is a church spiritual, and in Burrell’s fingers it blossoms into a bring-down-the-house gospel number. It’s sure nice when something proves worth the wait.